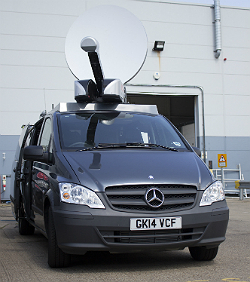 SIS LIVE delivers satellite uplink truck to British Army. Milton Keynes, UK, August 2014: Leading broadcast network connectivity and product design expert SIS LIVE has successfully delivered a bespoke satellite uplink truck to the British Army, to enable its media teams to deliver live HD pictures and other multimedia content from operational theatres around the world. SIS LIVE installed an easily-deployed, lightweight Ku band 1.2m DriveForce antenna linked to SIS LIVE’s own Uplink Management System (UMS), which incorporates its automated satellite booking system, uBook, with potential 24/7 access.